We here at the Bruce are always thrilled when the exhibitions of art and science we present have an impact on visitors. The current exhibition, Masterpieces from the Museum of Cartoon Art, is not only drawing praise from leading cartoonists and aficionados of this unique American art form, it’s also inspiring a new generation of cartoonists. We recently received a review of Cartoon Art from a young local cartoonist whose work has already received attention from area newspapers, including the Larchmont Ledger. Allow us to share Cole Johnson’s engaging take on the exhibition, as well as upcoming opportunities at the Museum for other young artists and their families to get creative. Enjoy! 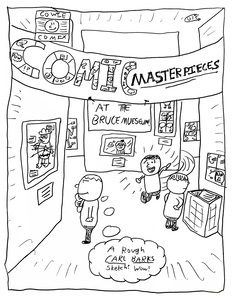 I’ve written comics for six years, however, everything changed the day I entered the Bruce Museum on Saturday, February 23. The day before, my visiting cousins and I worked to create a story about some of our existing characters, titled “The Fallen Moon.” Little did we know, the next day our world would be rocked forever! 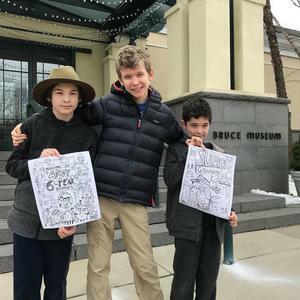 We went with our family to the Bruce Museum in Greenwich, to see what we had heard so many amazing things about, their cartoon art exhibition. As avid comic fans ourselves, we could not wait to learn more. We met our friend and cartooning teacher/collaborator Phil outside of the Museum. Together my cousins and I proudly displayed our artwork: posters of our long-running comic titles, The Adventures of Andy and Super Grandma - and thus that moment was immortalized in the medium of photography! As we entered the Museum, one of the first things that caught my eye was a Carl Barks original. It was a drawing of Donald Duck decked out in cowboy attire - a poster done in a rough pencil sketch format. I thought it was from “The Ghost Sheriff of Last Gasp” from the mid-1950s, but it was actually one of his earlier works. Even though these two drawings I had seen looked similar, I wasn’t completely surprised… Barks wrote two stories in the span of two years, both using the strange concept of Christmas on a submarine, so anything is possible! I noticed that up close, every aspect of the drawing used some sort of perspective, even the spurs of his boots. I read all of these stories in the Fanta-graphics re-releases of Barks’ many treasured stories, and have kept up with them over the course of multiple years. Barks has long inspired Cowie Comix works, from his dry humor, to the intricate perspective he uses in his artwork. One of the first things you will find as you step inside the Bruce Museum is a picture describing the language of comics by Mort Walker. It showed the technical terms for comic techniques such as action lines, which are called “hites,” and ”wiffets,” which are little clouds that sometimes appear at the end of a “hite.” My cousins and I never realized just how much there was to learn about comic books! We also saw some of the first comics ever printed in a newspaper, like The Yellow Kid, and some political cartoons that would later go on to inspire the modern comic strip. Many of them were far more realistic looking than modern day comics, but compensated for this by having far fewer panels. We appreciated the generous size of all of these exhibits, as they allow you to peruse the details without squinting at a tiny little box!! Later, as I returned to my normal routines and continued to draw comics, I absent-mindedly checked my email. My heart raced as I discovered: the picture we had taken in front of the Bruce Museum was featured in the Museum’s social media feed! I later called my cousins and told them the great news. I am so glad I had the opportunity to visit the Bruce Museum, and see the great cartooning works from across history. I hope to return soon, and would recommend it to anyone who even has a passing knowledge in cartooning … but they’d better skedaddle, because it will be gone on April 20! We here at Cowie Comix will take these new ideas to heart, as we continue to mercilessly pump out sequel after sequel of Adventures of Andy, Super Grandma, Luna the Dog, and more! On view in the Museum’s main galleries through April 20, 2019, Masterpieces from the Museum of Cartoon Art showcases more than 110 original works, including an early editorial cartoon by Thomas Nast, a spectacular Prince Valiant Sunday page by Hal Foster, and a witty New Yorker gag by Peter Arno, as well as classic Peanuts, Doonesbury, and Calvin and Hobbes comic strips. Treasures from this rich and varied repository represent all of the cartoon genres, including comic strips, newspaper panels, comic books, editorial cartoons, magazine cartoons, caricature, illustration and animation. The centerpiece of the exhibition is a recreation of the Museum of Cartoon Art’s Hall of Fame. Thirty-two artists were elected to this prestigious group between 1975 and 1997 including Walt Disney, Milton Caniff, Chuck Jones, Rube Goldberg, Al Capp, and Herblock. Each honoree is represented by a superlative example of their work and a handsome brass plaque. The first institution dedicated to the collection, preservation, and exhibition of cartoon art, the Museum of Cartoon Art was opened in Greenwich in August 1974. Founded by cartoonist and longtime Greenwich resident Mort Walker, it moved to Port Chester/Rye Brook, NY, in 1977, reopened in Boca Raton, FL, in 1996, and donated its collection to the Billy Ireland Cartoon Library & Museum in 2008. The Bruce is hosting an array of special programs and activities to complement the exhibition, among them several related programs for families and children. On Sunday, March 24, 1:00-3:00 pm is Art Adventures: Comical Illustrations, a drop-in program designed for children ages 4 and up and their families. The topic of our April 14 Art Adventures program is Design Your Own Comic. And save the date for the Museum’s Spring Family Day on Sunday, April 28, 1:00 – 4:00 pm, when we focus on Art around the World. From cartoon artists of Greenwich to the artisans found on the Silk Road, kids will be able to create their own landscape, make a paper tomb sculpture, and even create comics with artist Emily Curran. Family Day is free for Museum members and visitors with admission. For more information about Bruce Museum exhibitions and programs, visit brucemuseum.org or call 203-869-0376.